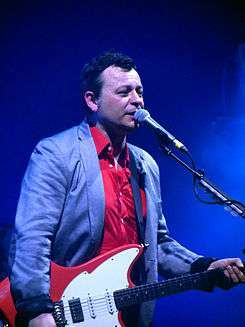 James Dean Bradfield (born 21 February 1969) is a Welsh singer-songwriter, musician and record producer. He is known for being the lead guitarist and lead vocalist for the Welsh alternative rock band Manic Street Preachers. Born in Tredegar, Gwent, Bradfield attended the local Oakdale Comprehensive School where he suffered years of cruelty and bullying (he claims he was "a Woody Allen-esque little nerd") for his name (nicknamed Crossfire), lazy eye, musical bent and small size. James formed a close relationship with three friends: his cousin Sean Moore, who lived with James and his family throughout their childhood after his own parents' divorce, and future bandmates Nicky Wire and Richey Edwards. Bradfield loved to run and was a steeplechaser, and soon grew fond of punk rock band The Clash, although his earliest musical love was ELO. He gave up his dream of "being like Napoleon" and decided that he wanted to be a rock star. He learnt to play guitar by learning how to play Guns N' Roses's Appetite for Destruction with the curtains drawn in his parents' front room. He currently lives in Llandaff Cardiff. Despite having said “I always get bored of the company of women really quickly,” he married the band's PR agent Mylène Halsall in a ceremony in Florence, Italy on 11 July 2004. The couple have one child, a daughter, who was born in 2011 He is a supporter of Cardiff Blues and Nottingham Forest. In 2015, Bradfield and fellow manic Sean Moore went to Patagonia in aid of the Velindre charity. 1 2 3 Power, Martin (17 October 2010). Manic Street Preachers. Omnibus Press. ↑ "BBC Wales - Music - Manic Street Preachers - James Dean Bradfield". Bbc.co.uk. 3 December 2008. Retrieved 29 February 2012. ↑ Price, Simon. "Manics On New Football Single". The Quietus. Retrieved 23 May 2016. ↑ "Manic Street Preachers members to hike through Patagonia for charity". Price, Simon (1999). Everything (A Book About Manic Street Preachers) (first ed.). Virgin Publishing. ISBN 0-7535-0139-2. Clarke, Martin (1997). Manic Street Preachers: Sweet Venom (first ed.). Plexus Publishing. ISBN 0-85965-259-9. Wikimedia Commons has media related to James Dean Bradfield. "You Love Us (Heavenly Version)"
"Theme from M.A.S.H. (Suicide Is Painless)"
"La Tristesse Durera (Scream to a Sigh)"
"The Masses Against the Classes"
"There by the Grace of God"
"The Love of Richard Nixon"
"Your Love Alone Is Not Enough"
"(It's Not War) Just the End of Love"
"Postcards from a Young Man"
"Anthem for a Lost Cause"